If you are currently going through a spell to dress in a minimalistic way, giving your preference to monochromatic pieces and turning aside all colorblock versions, negative space nail art designs might save the day, really. This newly kicked-off trend to create an illusion of cutout space on the nails is giving green light to plunge together many hilarious colors and shapes, to keep all nails alike or else dream up different designs for each nail. 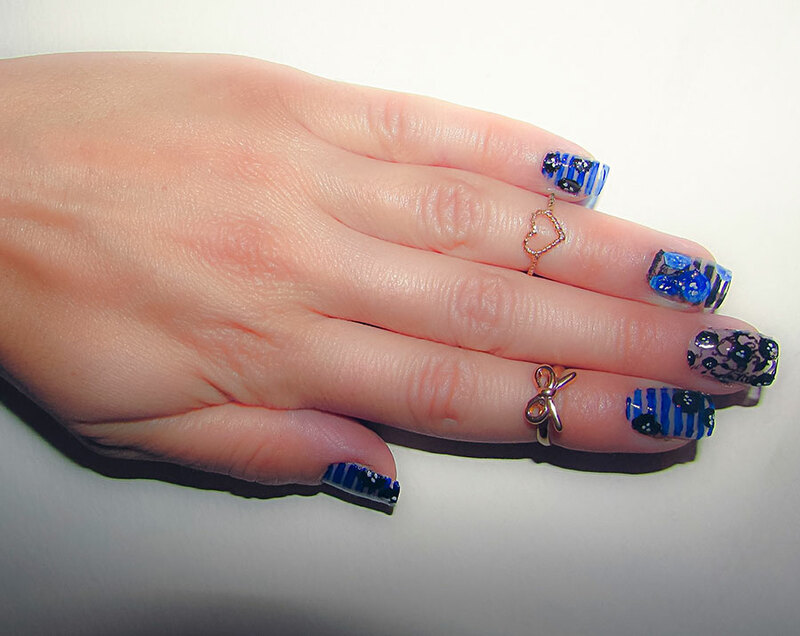 You can give free scope to your imagination or else follow our 11 negative space nail art ideas including geometrical shapes, floral motifs, dots, bows, hearts and Love in between. You just need to have many vibrant and muted acrylic paints, as well as tapes, stickers, dotters and brushes at your disposal. Black and pink together are a combination to marvel at for hours whether they happen on garment pieces or on your nails. 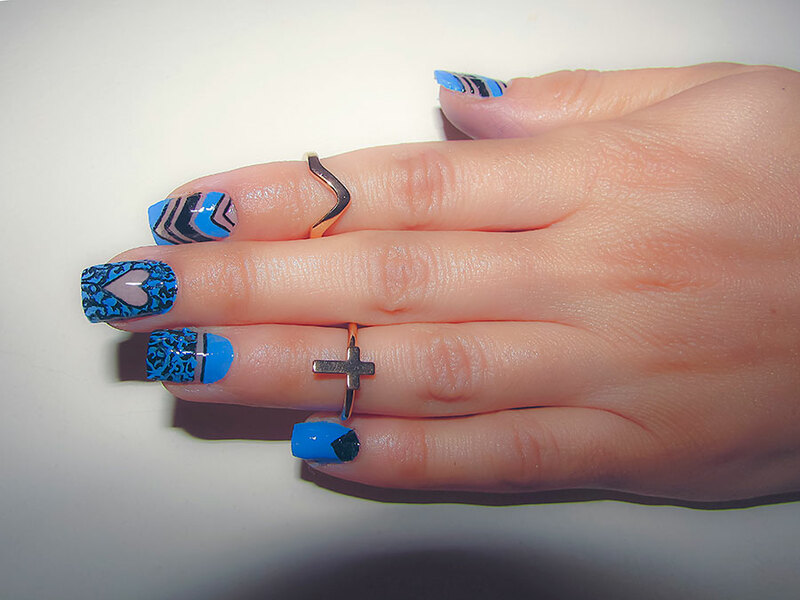 And when it comes to negative space nail designs, the two colors together are able to work miracles under the guise of stripes, dramatic zigzags or else a lovely butterfly fluttering and flittering. When you are feeling blue bring into play dodger blue and black to depict cool triangular shapes, and then buckle down to more miniature drawing to illustrate floral motifs. Perk up your mood and bring the middle finger forefront with a heart in the centre. Bunching up all those itty-bitty dots, stripes, triangles, squares, glittering particles and sprinkling them on your nails you will get another amazing negative space nail art. To get scarcely palpable watercolor effect stripes, first cover your nails with a transparent base coat, then using ultramarine acrylic paints start drawing many stripes on them. You can leave them alone or else embellish with some abstract images, while one of the nail plates might serve as a perfect space for some black chaotic pattern. 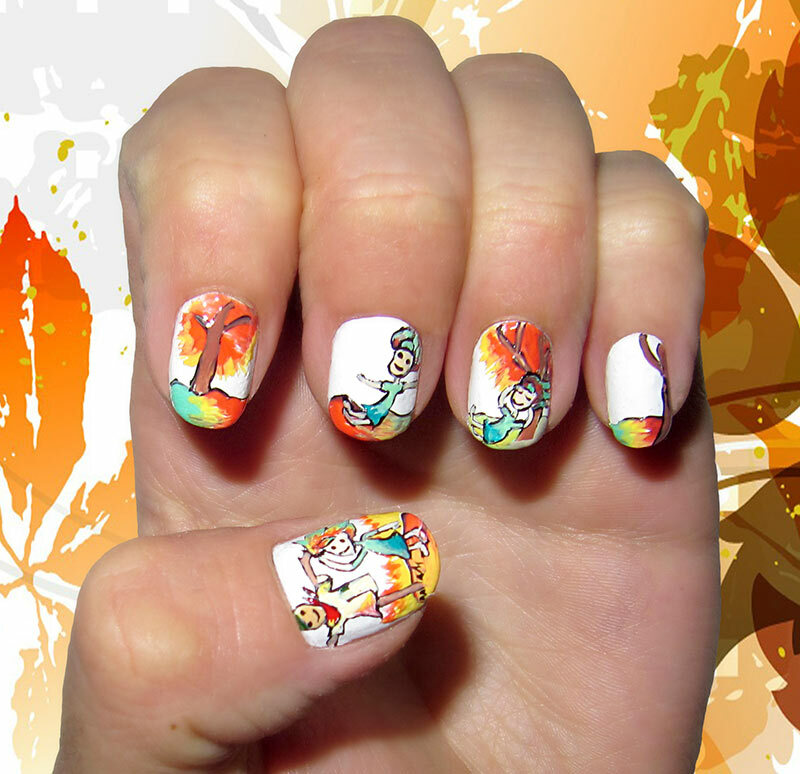 Let red turn on its enlivening light and depict a funny lollipop right on your nail, smiling and all surrounded with loving hearts and cardio beats. Whether you are browned off, in the doldrums or in high spirits, love is all you need. Just to manifest your life slogan once more, start with those inspiring words and surround them with many hearts, love letters and burning sun shades. Bring together lemon yellow and black to realize another stunning negative space nail art design. Leave your lunulae blank, while covering the nail plates with miniature botanical motifs with black shade tinged with yellow. Your nails might lodge an aromatic fuchsia flower that will sing in unison with stripes and triangular shapes in mint green and white just like a magical lawn. You might think black and white as something simple and uncomplicated but not in this case, for sure. 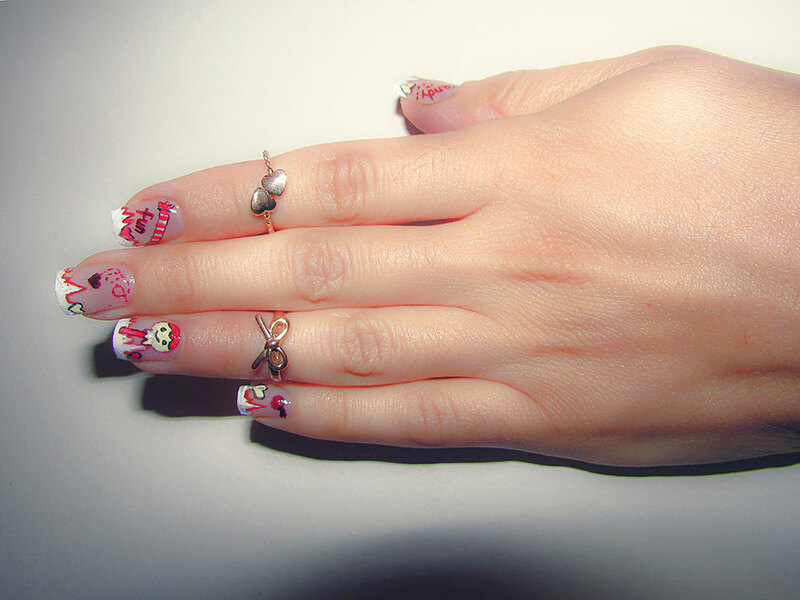 Fling yourself into black-and-white helter-skelter covering two of the nail plates with abstract chaotic images, another two ” with half-flowers, while leaving the middle finger for a round lattice. From now on delicate cobweb-fine knit will not only touch your body but also your nails. Coat your nails with transparent lacquer and spend countless hours on illustrating that miniature technique with flowers using black paint, in the end scattering sparkles on one nail to take it to haute couture level. 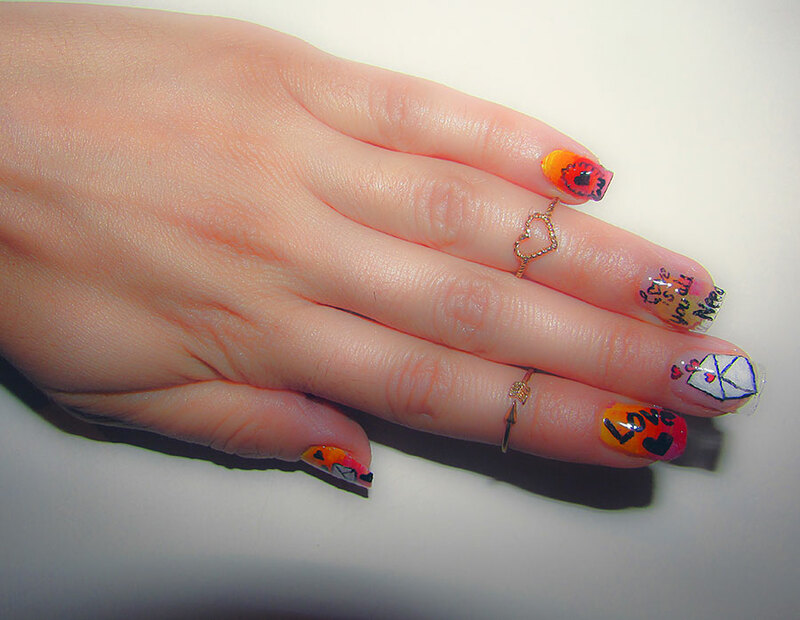 We are back to love again to present our last negative space nail art design on this list. Pile up everything evocative of love ” hearts, letters and lovey-dovey pink shade to send that important message Never Stop Loving!